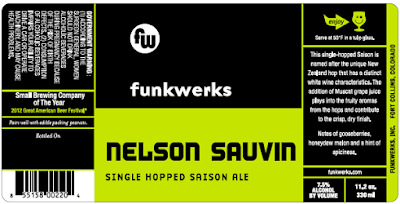 Becoming the latest beer to be packaged by the brewery in smaller-format 330 mL bottles, Funkwerks has announced the addition of Nelson Sauvin to its year-round lineup. 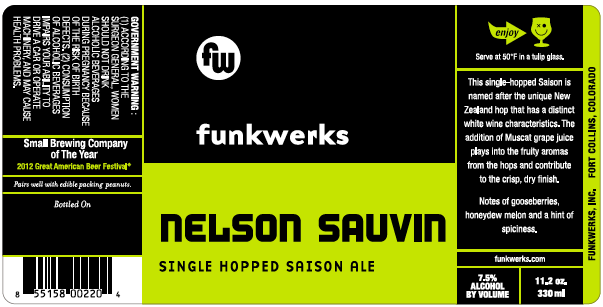 A single-hopped saison ale, Nelson Sauvin is named after the hop variety that is used in its making. It's described by Funkwerks as having the "aroma of gooseberries, honeydew melon and a hint of spiciness from the brewery's house saison yeast strain." As for the hop itself, the Nelson Sauvin variety comes from New Zealand and is known for its distinctive white wine character. In this case, the hops work with the addition of Muscat grape juice to enhance the beer's fruit attributes, while also contributing to its crisp, dry finish. "We've brewed Nelson a few times as an experimental [release] and it has always been very popular, particularly among our staff" says Gordon Shuck, co-founder and head brewer. Now, not only will the beer be available full-time, customers will also have the convenience of being able to purchase it in 4-packs of 330 ml bottles. Funkwerks began bottling in the smaller format last year, a decision co-founder Brad Lincoln suggests was influenced by the fact that "people tend to save larger bottles of beer for a special occasion or to share with others." With smaller bottles, he explains, people can purchase and enjoy a single beer without having to commit to something larger. According to a press release, bottles of Nelson Sauvin should arrive in North Texas by late February.